The restaurant sits on Wyckoff Avenue near Hart Street, which has become a clear dividing line between two different worlds. To the west, dilapidated factories and warehouses have been converted into loft spaces inhabited by tattooed young professionals and creative types. 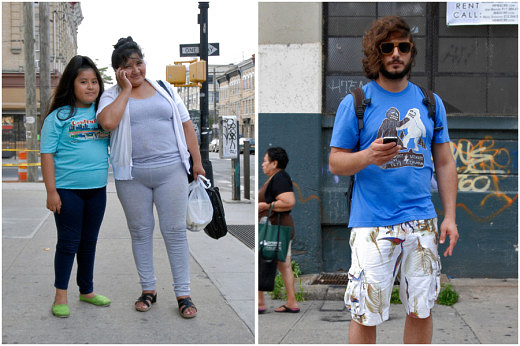 To the east, dollar stores and Mexican bodegas abound. You hear Spanish in Puerto Rican to Dominican accents. Cars drive by blaring salsa, samba and reggaeton. After just five months of living on this borderline, I feel right at home. I was born in Mexico to a Mexican father and lived there until the age of 12. But I’m also half Australian: I lived in Melbourne until I was 24 and went to a private Anglican school. Much like Mesa Azteca, I’m caught between two worlds: Hispanic and hipster. When I walk into one of the bodegas east of Hart Street, I feel slightly unwelcome, as if the clerk is thinking, “Here comes another white yuppie.” With my white skin and freckles I come across as a skinny Caucasian. Then I speak in Spanish. At first there’s confusion, and so the reply is in English. But once it becomes clear that I’m fluent, and that I grasp the nuances of Mexican slang, there’s often much greater warmth. Once, I got a dollar discount off my sandwich. 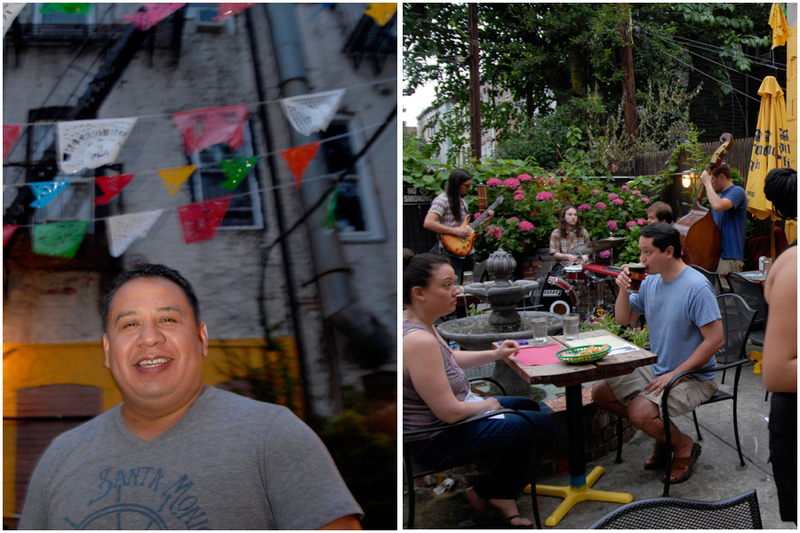 Jose Hernandez, the owner of Mesa Azteca, moved to Brooklyn from Puebla, Mexico in 1987. Back then, he says, Bushwick was known as “Vietnam” because of the deadly levels of crime. To find his apartment, Ben turned to Nooklyn. The real estate agency’s founder, Harley Courts, says that people are attracted to Bushwick because of (you guessed it) lower rent. “You can come start a business with a very low budget, you can do [creative] projects and do things that you can’t normally do or fund in other areas,” he told me. Indeed, in the last year or so, Heavy Woods, Mazelle, and Cobra Club have opened up on Wyckoff Avenue. Pickthorn, a “custom hair shaping studio” where “each person is seen as a unique canvas,” opened this year. Another new business, Bat Haus, offers workspace for freelance writers, designers and computer programmers in a large, open studio. 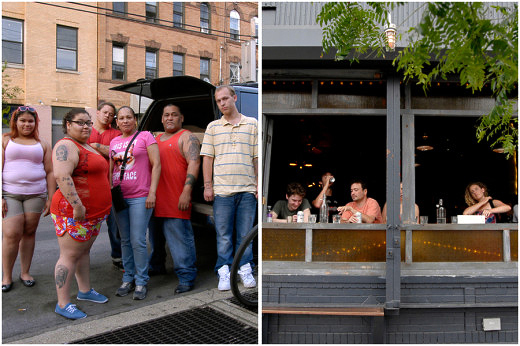 Even Nooklyn, with its hip young employees and converted-loft office, is representative of the change in the area. Meanwhile, east of Hart Street, the restaurants have names like Taqueria el Paisan and El Sol de Quinto – and they don’t offer WiFi or cappuccinos. 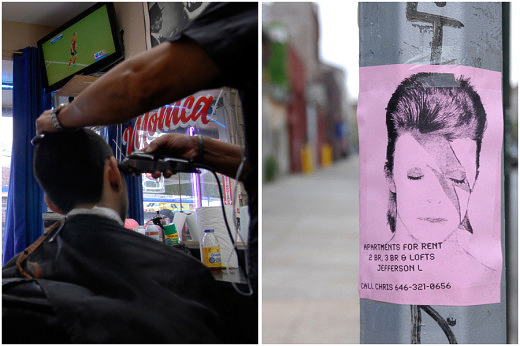 Places like Big Poppa’s Barber offer buzz cuts for $15. Street vendors sell fruits, vegetables and flowers on the corners. The contrast inevitably brings some tension to the neighborhood. And it hasn’t always been subtle. When my neighbor, Mabel Rodriguez, moved here seven years ago, a Bushwick resident approached her at a local restaurant. Though I’ve experienced this tension to a degree, I enjoy living on the border because I can engage with both sides of my cultural self: I can go down the street and enjoy a cappuccino, or I can walk up the street and get some amazing chilaquiles and feel right at home. But even the Hart Street barrier is eroding. Courts admits that when Nooklyn first opened, “it was always ‘I will not go past Montrose.’” Now, he says, “a lot of people come in and say ‘I will not go past Myrtle-Wyckoff.’” The trend carries over to commercial properties, too: “People are showing interest in being the frontiers of those areas,” Courts says. As places like Frtizl’s open farther east, the Hart Street barrier is bound to dissolve. For now, Mesa Azteca acts like a cultural bridge. Hernandez admits that it’s primarily for the neighborhood’s relative newcomers that he started doing jazz on Thursdays. He says it’s now one of his busiest nights. Does anybody remember research? Or journalism? 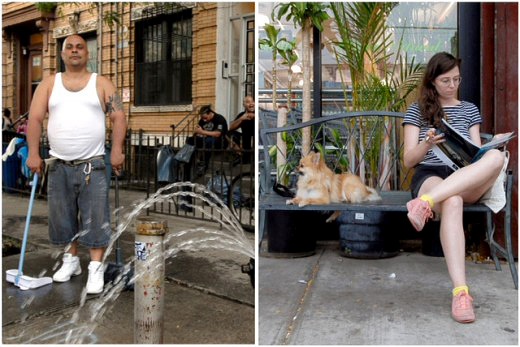 There are very real stories about gentrification in NYC that want to get written. But there don’t seem to be any journalists with the motivation to actually do the work needed to write them. A lot of this history is not recorded anywhere except in the memories of those who lived through it, and every year there are fewer people left with this knowledge. But on the other hand, every year the statistics and other large scale data get better. Anyway, perhaps I am just an old man with sour grapes, but I feel like there is a lot more to say about this important subject than name checking a couple delis or restaurants and glossing over 30 years of history. I’m 61. Native NY. Born, raised and educated through graduate school right here. I have watched the transformation of our great city from lower east side junky haven turn family wonderfulness to Bed Sty being a white boy’s no fly zone, now acceptable of all humans kind or not. Thanks for “write bite.” It captures the essence of the city I love so well. Fabulous! Well written, thoughtful, sensitive and full of foodie, cultural and social observations. Thanks!